Across America, “big box” stores rise like bland jewels in settings made just for them—huge parking lots and highways built or diverted to direct traffic flow. With the landscape so altered, what happens when a chain abandons a store to build a larger one nearby? 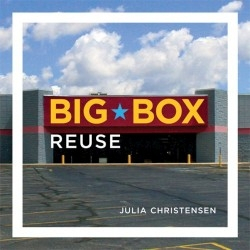 Julie Christensen’s Big Box Reuse examines just that: adaptive reuse of Wal-Marts and K-Marts by communities, business people, and city councils. True to form, Big Box Reuse is a book for many collections. It will easily appeal to art and architecture aficionados, environmentalists, city planners, cultural studies academics, and any intellectually curious person who shops at the big chains—though it’s very small font may pose an issue. Big Box Reuse is anything but bland.